When it comes to American conspiracy theories, #1 would be the circumstances around John F. Kennedy's assassination, #2 What really happened in Roswell, New Mexico, and #3 Would be the possibility the Apollo11 1969 Lunar Landing was faked, that Neil Armstrong never took neither step nor leap on the moon. If this conspiracy were true it begs the questions how do you make it look like astronauts landed on the moon, and who would be behind the subterfuge? Enter OPERATION AVALANCHE a faux documentary movie which explores the how, who and what fors of creating the Moon Landing Hoax through the lens of two young, Harvard recruited CIA Agents/Documentary Filmmakers and out of the box thinkers. Finished with their first mission investigating Stanley Kubrick as a possible Pinko, Matt Johnson (Matt Johnson) and Owen Williams (Owen Williams) want to be put on the mission to find a mole inside NASA. They come up with the brilliant plan to infiltrate the Space Administration by posing as documentary filmmakers. During the course of their operation, they discover NASA's not really ready to land a man on the moon; that they are probably still a good 4 or 5 years away. This is a problem because the delay will surely allow the Russians to get there first and JFK promised this feat would happen before the end of the decade, and although he's gone, his words live on... So Matt & Owen, their camera crew along with a semi-douchebag senior agent (Jared Raab) set out to create the Moon Landing in a movie studio, only the price of fooling America can come at the highest cost. I was really impressed with this movie, it's clever to imagine two hot shot CIA neophytes pulling off the caper of all capers. Then there's the camera work. Yes, "Found Footage" tends to now be denigrated a bit, and there are a couple times you don't feel the camera would've been rolling, but for the most part, it creates a fantastic storytelling device, and it allows for more leeway when it comes to editing, especially when cutting from scene to scene allowing it to appear as if the camera just stopped rolling. Because they shot it all on old video cameras and then transferred it on to 16mm, the look of the film is vintage 60's - further enhanced by inter-cutting fair use historic footage, using old filmmaking equipment still in use at York University's film school where Johnson finished his Masters making Operation Avalanche. And even further enhancing the authentic look of the film - real footage was taken at NASA and historic Shepperton Studios, at little to no cost. How? Matt and his team actually pretended to be documentary filmmakers to visit these institutions and interview people on the pretense of making an educational film, not this film, Operation Avalanche - so it becomes artifice imitating life, imitating art? Well, something like that. The movie actually only cost 1Mil to make - a sum given to them in good faith by Lionsgate who optioned the movie on a pitch based on the success of Johnson & writing partner, Josh Boyles first film The Dirties, which won Grand Jury Prize for Best Narrative at the 2013 Slamdance Film Festival. Best of all... 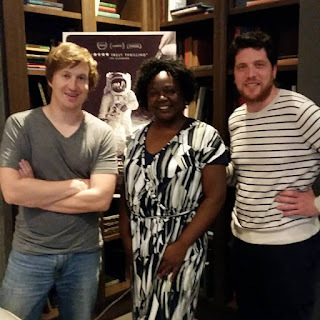 I got to interview Matt Johnson and Producer Matt Miller while they were in Philadelphia promoting the film. I get a rush out of interviewing filmmakers and actors, but it's so gratifying when you can tell the person(s) is really responding and taking note of you! T&T: You talk about the moon landing as being a time in history that Americans point to as a defining moment of pride. But do you think your generation and younger would really be affected if it were found out to have been an elaborate hoax? 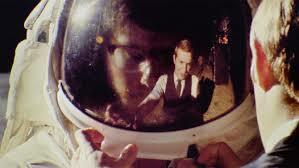 Operation Avalanche Would Millennials care? T&T: The Matt Johnson in Operation Avalanche seemed to eat, drink, sleep the mission, where the on screen Owen Williams had a wife and baby, Matt acts as if nothing else in his life exists. When you were making the film were you that submerged, do friends, family, other projects go off to the side or are you a good multi-tasker? T&T: I know you two don't personally believe the Moon Landing was faked and even discovered while making Operation Avalanche just how almost impossible it would have been to do, still, what kind of responses are you getting from those that run websites passionately attesting to the Apollo 11 Lunar Landing as a hoax? T&T: Shooting undercover at NASA & Shepperton Studios was greatly out of budget constraints, but there’s also a sense of ingenuity and daring to it all. Would you say that’s a big part of what drew you to wanting to make films in the first place? And would you then ever want to do a big studio blockbuster where you don’t have to be as inventive because you’d have a larger budget? And more! Watch Video above for answers. A Lionsgate release. Produced by Matthew Miller, Lee Kim, Matt Johnson. Executive producers, Aram Tertzakian, Nick Spicer, Nate Bolotin. Co-producer, Jared Raab.